Canasta is a rummy style game with the objective to meld similar ranking cards. 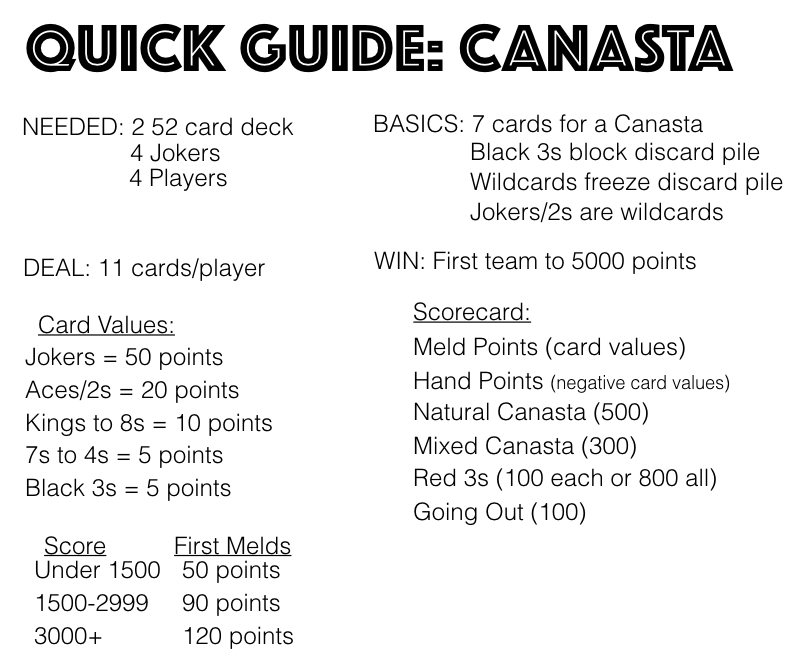 There are different variations to the card game Canasta, here you will find how to play with 4 players divided into 2 teams. Teammates will sit across from each other. Below you will find the video tutorial, quick guide, and explanation. Deal: Each player is dealt 11 cards, one at a time. The top card of the remaining deck is flipped up. Objective: The objective of the game is to be the first team to score 5000 points. Points are scored by melding cards of the same rank together as a team. A meld has to have at least 3 cards to be started. The jokers and 2s are wildcards. These wildcards can be added to any meld, but a meld can never have more wildcards than cards of the actual number. Game Play: The player left of the dealer is first to play. If a player is dealt a red 3, or if a red three is ever drawn, it is immediately played on the table and a card is drawn to replace it. The Draw: Each turn begins with a draw. A player is allowed to draw from the discard pile if the top card is used to create a meld, or can be added to an existing meld. If the top card of the discard pile is successfully melded, the player gets all the other cards in the discard pile. If a player cannot draw the top discard, the player must draw from the deck. The player can also choose to draw the top card of the deck even if it is possible to draw the top discard. Melding: After the draw, a player can choose to create melds if possible. 3 cards of similar rank are needed to start a meld. Wildcards (jokers and 2s) can be used in any meld, but a meld can never have more wildcards than natural cards. The first melds laid by a team need to have a combined card value of 50 points when starting the game. Once a team hits 1500 game points, the first melds need to have a combined card value of 90 points. Once a team hits 3000 game points, the first melds need to have a combined card value of 120 points. The value can come from multiple melds in the same turn. The Discard: A player’s turn ends with a discard. If a black 3 is discarded, the discard pile is blocked. A player cannot draw from a blocked pile. If a wildcard is discarded, the discard pile becomes frozen. The discarded wildcard should be played down horizontally on the discard pile. The frozen discard pile can only be drawn from if a player is able to make a natural meld with the top card. The meld cannot include a wildcard. The top card on a frozen discard pile cannot be drawn to add to an existing meld. Going Out: A meld of 7 cards is known as a canasta. A player can end the round if his/her team has a canasta. When a player from a team with a canasta is able to end his/her turn with no cards left in his/her hand, the round is over. A player is allowed to ask his/her partner if he/she should go out. Depending on what is left in the partner’s hand, the partner may want the round to continue. Scoring: There are 4 areas where points are scored. Card Values: Using the card values from above, teams score the points from the cards in their melds, minus the points from the cards left in their hands. Canastas: A team gets 500 points for each natural canasta and 300 points for each mixed canasta. If the canasta does not include a wild card it is considered a natural canasta. If the canasta does include a wild card it is considered a mixed canasta. Red 3s: A team gets 100 points for each red 3. If a team gets all 4 red 3s, they are awarded 800 points. Going Out: The team of the player who ended the round gets 100 points. If a red 3 or a black 3 is the first upcard flipped from the deck, another card from the deck is flipped over. If a wildcard is the first upcard, another card is flipped from the deck and the wildcard is placed sideways, freezing the discard pile. A meld can have more than 7 cards, but the only additional points come from the value of the card added. Black 3s can be melded if the player melding them is going out to end the round. If a team has no melds when the opposing team goes out, the value of their red 3s is deducted from their score. For example, team 1 has gone out, and team 2 has no melds with 2 red 3s. Team 2 loses 200 points for this round.